We can’t help ourselves reviewing pizza places at the moment. 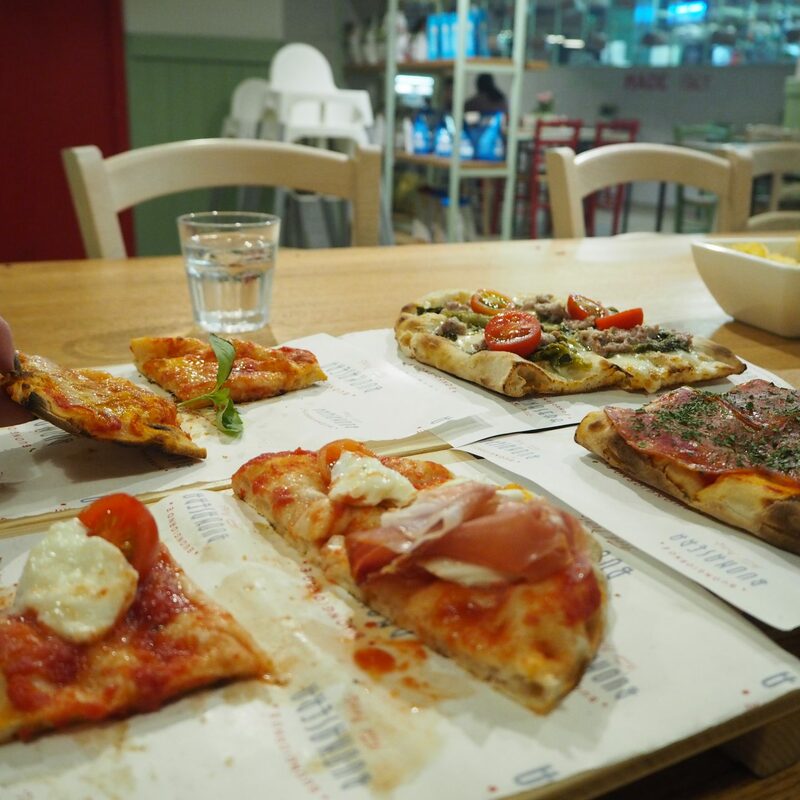 It’s a good thing though, because Oxford has had several, decent new pizza restaurants pop up in the last 1-2 years – is Buongiorno E Buonasera another example? Read through our post to find out. According to themselves, Buongiorno E Buonasera claim they are a venue making Italians feel at home, no matter where they are in the world. And everybody else feels like they are in Italy too – enjoying a real Italian pizza as well as delicious Italian food and drinks. Buongiorno E Buonasera is a bit of a mouthful the first time you see the name. Translated directly into English it means “Good Morning and Good Evening” lending itself to a warm and welcoming brand before you even set foot into any of their restaurants. They currently have two locations, one in the centre of Oxford in Gloucester Green, and the other on the London Road in Headington (which is the one we visited and is slightly larger in size). 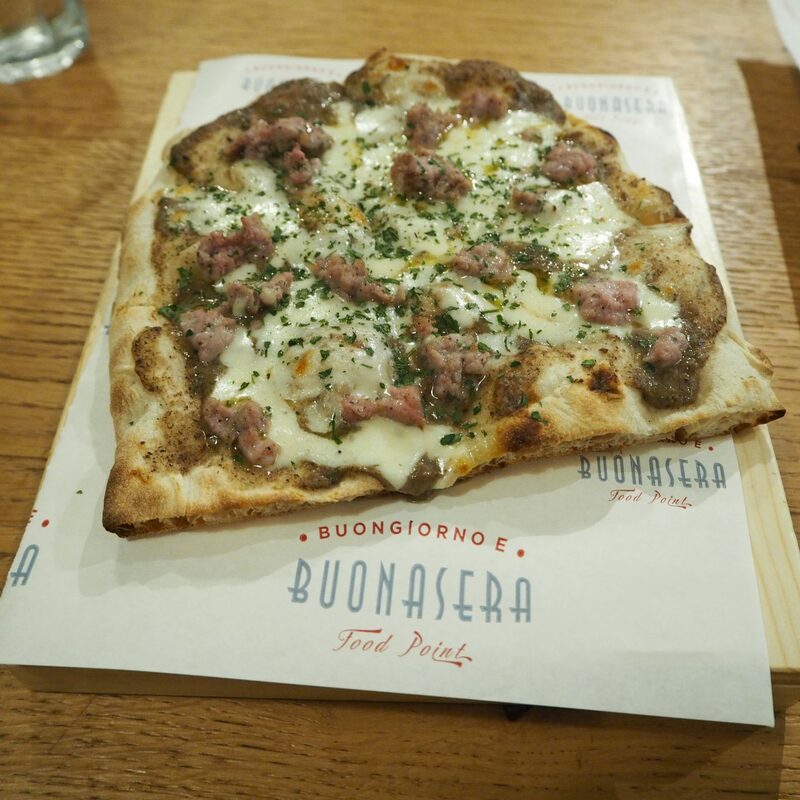 In terms of specialities, our server explained that Buongiorno E Buonasera pride themselves on offering pizza in the style of Pizza Romana (traditional pizza that originates from Rome). Having never visited Rome and trying their local pizza before, I wasn’t sure what to expect. 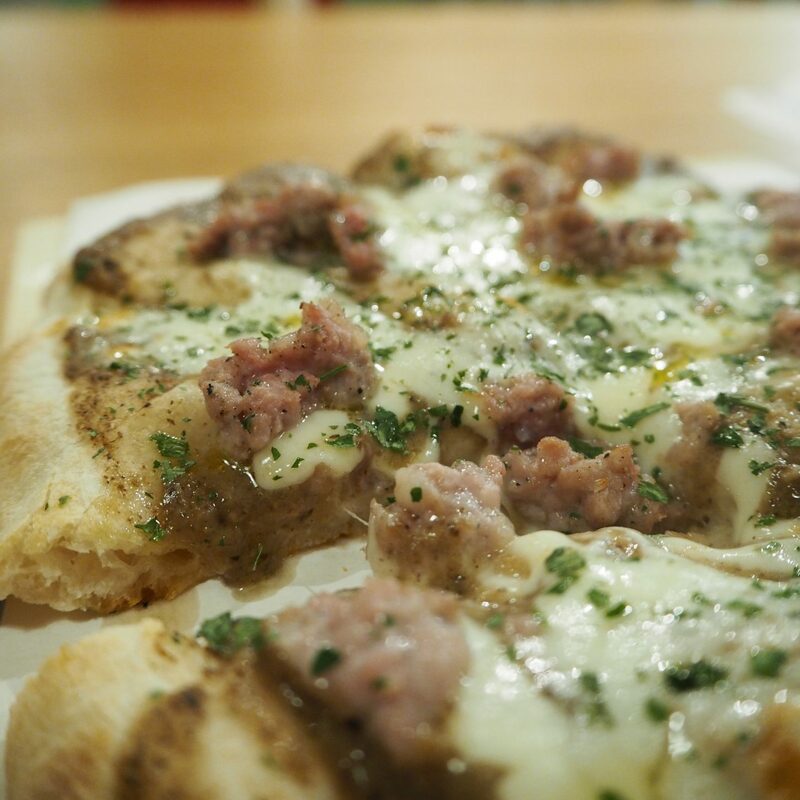 In terms of the layout and feel at Buongiorno E Buonasera, it has a chilled casual-dining vibe. We were left to choose to sit wherever we liked and it’s a help yourself to napkins and cutlery sort of thing and it was quite refreshing how chilled the whole experience was. Without further adieu lets get to the food. To start we shared a selection of Parma ham, ham and toasted bread. This was delicious, particularly how fresh the bread tasted. 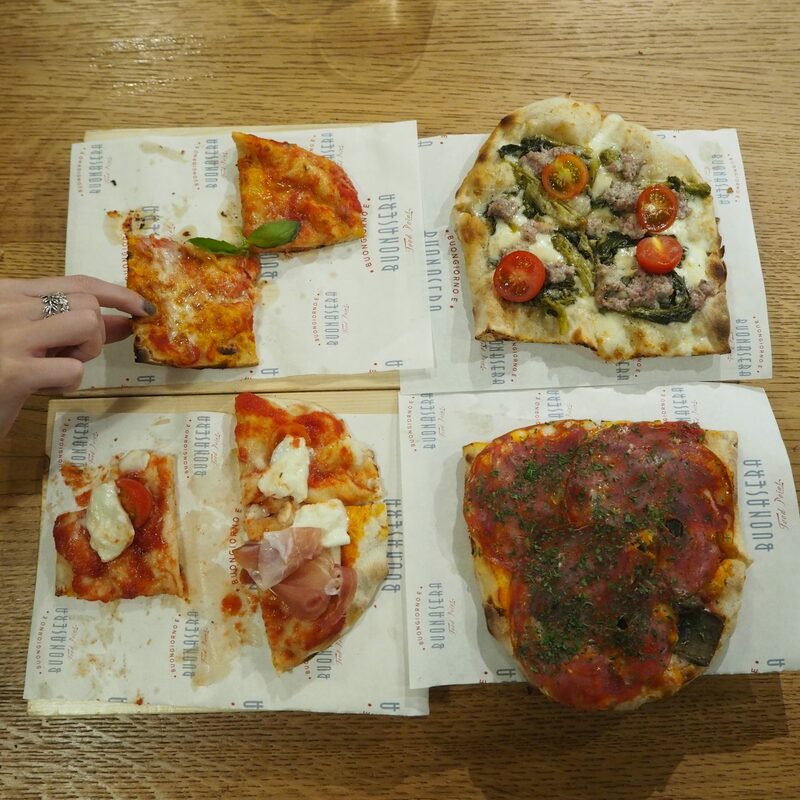 We tried quite a range of pizzas to be fair. In terms of size they were smaller than I was expecting but I think that’s the point – you get a few and they are great for sharing around. The best comparison I could think of in terms of size is somewhere between a Dominos small and medium pizza. I was impressed by how simple some of the toppings sounded, yet they tasted so fresh and full of flavour when put together. On that note some of the combinations of toppings I have not seen on offer anywhere before, for example spicy salami and aubergine on the Friarielli worked so well. 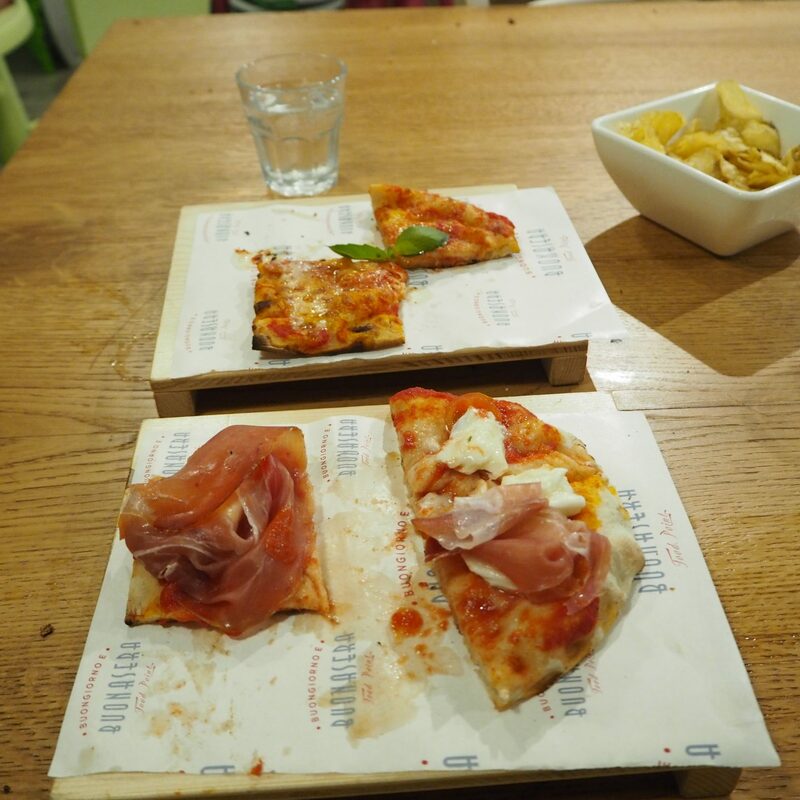 My recommendation if you were to try two pizzas would be the Saporita (pure cheese heaven – see the picture further down of me lifting the slice up off the table!) and the Tartufo (the picture straight after the Saporita) because the black truffle sauce brings such a unique flavour to the pizza. To finish we had The Nutella, which as the name suggests, is one of their lovely pizza bases covered with Nutella and topped with icing sugar, which was perfect to end on. I normally like to screenshot a menu directly from the website from where I am reviewing, but as it’s laid out so nicely on their website, go and check it out here and you can compare what we’ve had against the menu if you like. So overall I would rate my experience and the food at Buongiorno E Buonasera as a solid 8/10. I would say to me it feels most suitable for casual lunch time dining, or perfect for going with some mates for dinner. If I were you, I’d take advantage of their all you can eat Pizza’s on Monday nights, available at both Gloucester Green and Headington. You need to take a minimum of three people so ideal for going with a group of mates.